A double-strand wrist mala of 27 dark garnet beads on gold filled wire, with one double-capped central or guru bead. 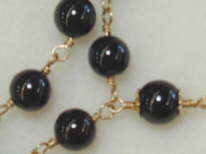 The beads measure 1/4 inch, or 6 mm. 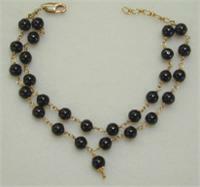 The doubled strand measures 7 1/4 inches, with a 3/4 inch adjustment chain.